This document specifies a method for the determination of di-iso-butyl phthalate (DIBP), di-n-butyl phthalate (DBP), benzylbutyl phthalate (BBP), bis-(2-ethylhexyl) phthalate (DEHP), di-n-octyl phthalate (DNOP), di-iso-nonylphthalate (DINP) and di-iso-decyl phthalate (DIDP) (as specified in Annex A) in toys and children's products. 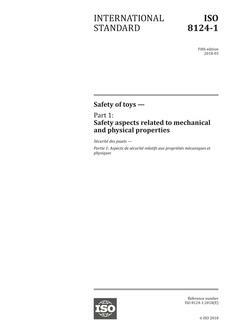 This document is applicable to toys and children's products which are made of plastics, textiles, coatings and liquids. This document has been validated for polyvinylchloride (PVC) plastics, polyurethane (PU) plastics and some representative paint coatings (see Annex B). It might also be applicable to other phthalate esters and other product materials provided that adequate validation is demonstrated.